The story behind the photo included a visit from Thursday night through Sunday lunchtime from our younger son and his family. You may remember that our DDIL2 has a good friend who lives here in Bend. It was the friend's DH who helped us hang my "Sistine Chapel" on the wall over the stairs. The friend also visited DBIL in the hospital when he had his surgery (she's a surgeon) and was the one who stapled Johan's scalp back together. 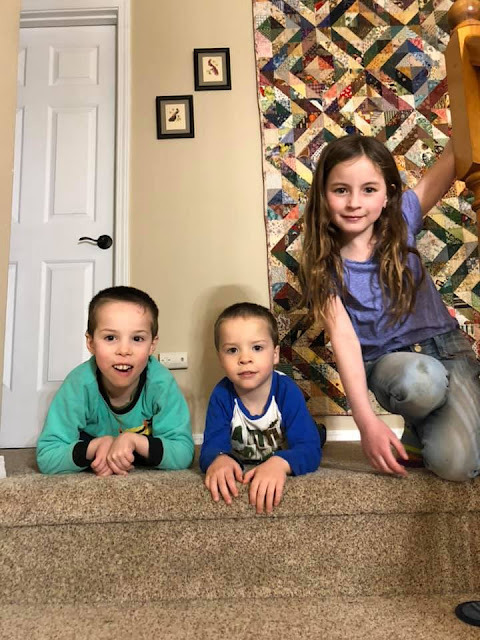 (Johan is the one in the middle in the photo.) The friend and her family came for dinner Friday and brought food, so it was a potluck. The little girl in the photo is their daughter. She looked up when she came into the kitchen and was excited to see the dolls from The Doll's Storybook hanging out on top of the kitchen cabinets. I brought Jolena down from her perch to visit. "I've only seen her on my mom's phone," she said. She has been reluctant to read, although she is able to, but she likes the stories. I pulled out my copy of Veronika's Birthday (the book I made as an iPhoto project last year for our grandchildren's birthdays), wrote an inscription in it and gave it to her. She was very excited. She behaved as if she were meeting a movie star (Jolena) in person. That was fun for me, too. Jolena was wearing the latest Everyday Play dress I finished this past week. I used a self-striping sock yarn (KnitPicks Felici) and went down a needle size to make this slimmer version of the dress, which will fit an American Girl or other 18" doll in the original version. With the tighter gauge, I needed 18 extra rows/rounds in the skirt to make it long enough. It has a placket in the back with three buttons, and it can be worn with the buttons in the front as an option. When Clue #2 for the Rose City Yarn Crawl Mystery Knit Along became available, I started that. DDIL2 is making the same shawl. We will wear them when we participate in the Yarn Crawl in March. I can't post a photo yet, in case someone who is participating might be reading this blog post and wants to be surprised by the pattern, much the same way someone might have been recording the Super Bowl game because they were unable to watch live, but they didn't want to know the outcome. I'm awaiting Clue #3 today. 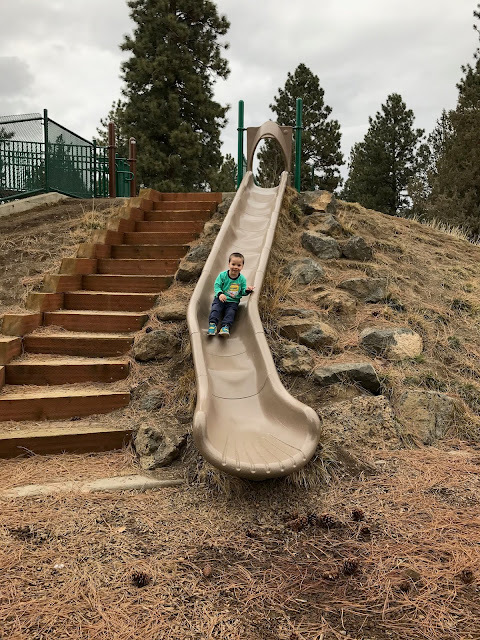 Earlier on Friday, we walked to Ponderosa Park, where the two dog parks are, along with a nice playground and some skateboard ramps for older kids. 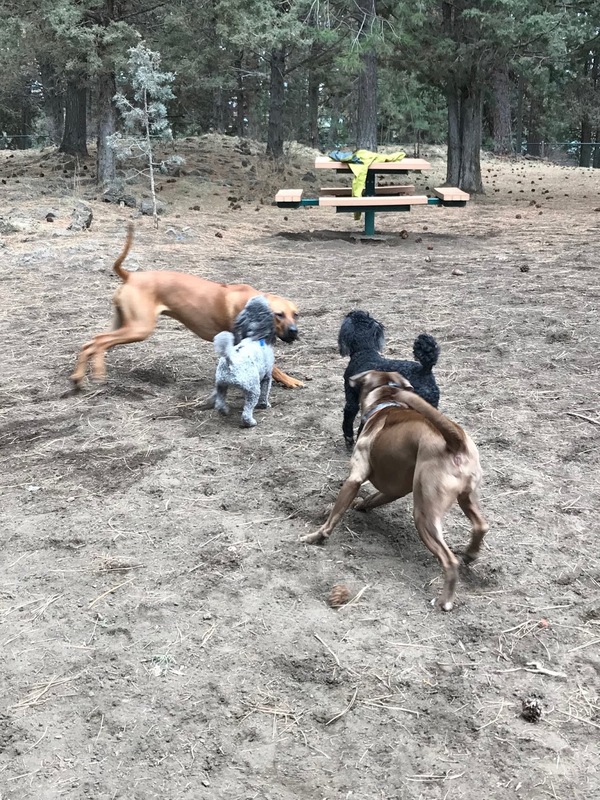 The men stayed with the dogs in the dog park for big dogs, because our Louis (the granddog) is too big for the little-dog park. There were several dogs there, including a puppy that we are sure will someday be as big as a horse. The dog's size didn't bother Dusty, as you can see in this photo. Rocky and Louis (seen behind Rocky) weren't too worried, either. The boys (the human ones) went to the playground. This fun slide has bumps, which Johan thought was pretty fun. The weather was nice for a few days. 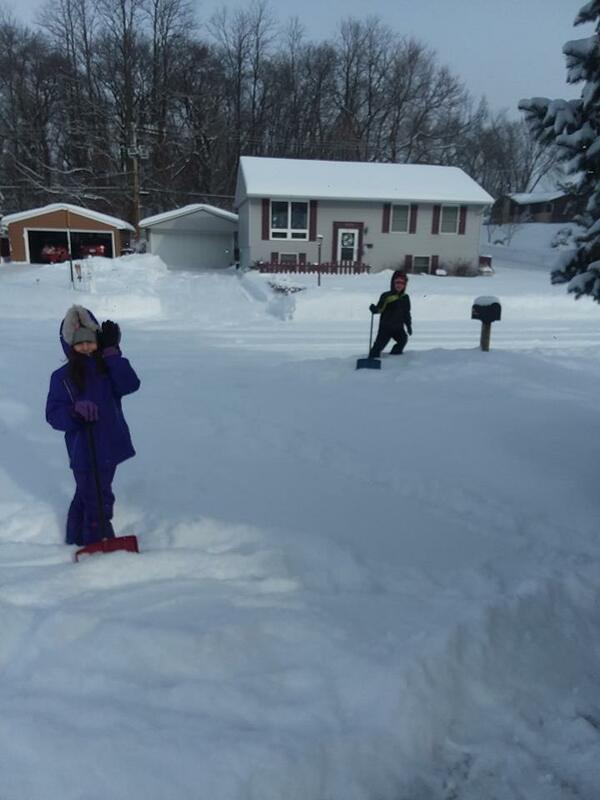 The Wisconsin grandkids weren't so lucky, but maybe they didn't mind so much, because they had a few days off from school to play in the snow. They were hoping to shovel the driveway, but when this photo was taken, I think they were trying to locate it. The temperatures got down to at least -24ºF and classes were cancelled for the schools and the university. I managed to make it back to choir practice on Wednesday and got to sing on Sunday morning. My voice is back to normal (for me), and it's good to be singing again. I ended the week cheering on the New England Patriots to their Super Bowl win, while my California-native DH and his brother watched their LA Rams lose. What a great game, though, well played by both teams. What's on my needles: Finished the second clue in the Mystery Knit Along for The Rose City Yarn Crawl, which takes place in March. I also finished the second Everyday Play dress, this time for Jolena. 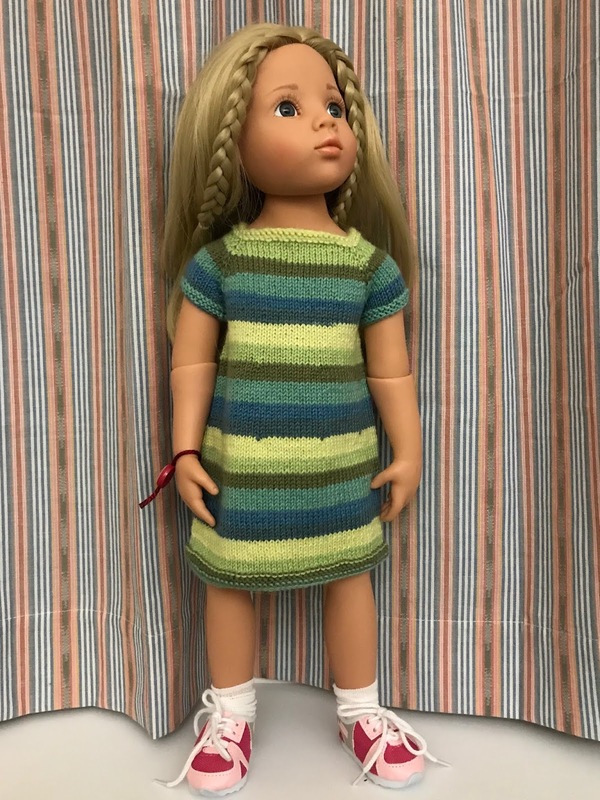 I was hoping for a better fit for Happy Kidz dolls by going down a needle size and then making the skirt longer, and was pleased with the result. What's on my Sparrow 15: Still waiting, but a shirt for Billy is planned. 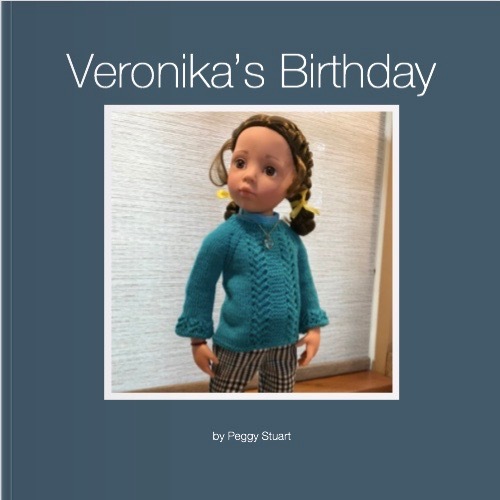 What's in The Doll's Storybook: Veronika's Birthday, where Veronika finds a new way to celebrate her birthday. What's on my iPad/iPhone: Finished The Bride of Ivy Green by Julie Klassen. Now listening to The Cuckoo's Calling by Robert Galbraith (aka J. K. Rowling), and liking it so far. What's in my wine glass: I have heard that people have missed my wine selections. I couldn't appreciate wine when I was sick, and I'm just getting my taste for wine back. Right now I have a glass of Motto Backbone Cabernet Sauvignon 2014, which I'm finding very nice. What's my tip of the week: Cotton shirts and blouses will need less ironing or none at all if they go from the washer into the dryer for only 15-20 minutes and are then taken out and hung up still slightly damp. We had one day in the 60s, and then the front moved in. It has been snowing since early this morning. That was very sweet of you to give that book to that little girl. Hopefully it will instill a love of reading in her. Our snow has all washed away because we have had a lot of rain. Unfortunately our temps have dropped again so it is back to feeling like winter again. It is like MO can't make up its mind if it wants winter or spring weather as we have gone from below zero temps to almost 70 to now back in the low 30's all in the space of 5 days! Looks like everyone is having a grand time.